Join us for a discussion and reception with the Ambassador to the U.S., Vasko Naumovski, of the Republic of Macedonia and discussing the topics on Transatlantic Trade and Investment. His Excellency will be speaking about the current political climate in Europe and its implication on US business interests, as well as educating the attendees about Macedonia, our mission in the States and the experience of American companies in our country. Guests will have a chance to speak to a seasoned DC diplomat and a European Union negotiator about policy impact and future predictions regarding the EU. The event is the first in a series of receptions in Texas prior to his official meeting with Secretary of State of Texas Carlos Cascos, with the aim of establishing further economic ties between Macedonia and Texas. His Excellency Vasko Naumovski Ph.D, the Ambassador of the Republic of Macedonia to the United States is a veteran statesman and a highly esteemed academic on International Law and European integration. As Ambassador, His Excellency has focused on improving bilateral relations and the overall co- operation between Macedonia and the United States, including the reinforced support from the USA for Euro-Atlantic integration processes of Macedonia, especially within NATO frames. He places focus on issues like defense, parliamentary co-operation with the United States Congress, trade and attracting American investments, as well as health and education. Ambassador Naumovski served as deputy prime minister for Euro integration, as well as special envoy for negotiations of the naming dispute with Greece. 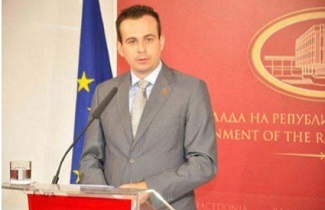 He graduated from the Faculty of Law “Justinian I” in Skopje, International law and received his MA degree at Rhine University “Friedrich Vilhelms” in Bonn, Germany, and another MA degree at the Faculty of Law “Justinian I” in Skopje on topics Macedonia’s integration into the EU. In 2008, he earned his PhD at the Faculty of Law “Justinian I” in Skopje on Influence of the European institutions and the European Union with the countries of the Western Balkans. Since 2005, he has been working at “New York University Skopje”, at the Faculty of International Relations, Politics and European Studies, as assistant professor of International law and EU law, as well as a visiting professor at the Faculty of Law at “Justinian I”. Author of numerous scientific papers in the field of European integration and international law, he participated in many international scientific conferences and has carried out long study tours in Europe and the United States. During undergraduate and postgraduate studies was awarded with scholarships by the German foundation “Konrad Adenauer” and was awarded the scholarship for study tour in the United States by the U.S. State Department.